Even though the concept emerged originally for physical frailty, more recently it has been supplemented by the concept of cognitive frailty, which might be referred to reduced neurophysiological reserves. Cognitive frailty might be both the cause and the effect of physical frailty. It may be detected with cognitive tests, such as the MMSE score and the cognitive abilities screening instrument (CASI). The proposed definition of cognitive frailty is a syndrome characterized by both physical frailty and cognitive impairment in absence of dementia. Cognition is now considered a relevant domain of frailty (Qingwei et al., 2015). Cognitive and physical frailties interact with each other: cognitive problems and dementia are more prevalent in physically frail individuals, and those with cognitive impairment are more prone to become frail. Finally, social frailty is significantly associated with disease outcome and mortality risk. The recent FINGER study (Lancet, 2015) clearly showed that multi-domain intervention could improve or maintain cognitive functioning in at-risk elderly people from the general population. Overall, frailty consists in the vulnerability of aged population to adverse events as the result of the subtle and progressive metabolic and physical changes which make the individual more liable to age-related diseases and their consequences. Aging causes a progressive decrease in the physiological reserves of multiple organs as well as diseases affecting the neuroendocrine, homeostatic and immune systems. Genetic or environmental stressors may accelerate this progressive decay. People affected by frailty are not effectively ill, yet they are more fragile and little perturbations of their daily life or the accidental occurrence of an adverse event can precipitate their condition into disease. One might suppose that the fragile individual is running at his/her limits, and has no reserves to cope with stressors. The fact that, at the highest level of frailty, the scale considers that the subject is dependent on the surrounding caregivers puts in sharp evidence the social aspect of frailty since the person progressively loses its autonomy. Actually, frail patients have more need for assistance with mobility, self-care and usual activities, and the progressive loss of self-confidence may cause isolation, reduced physical activity, progressive isolation and decreased social interaction that may further worsen the condition. Targeting cognitive and physical frailty, i) by a correct identification of the signs of progressive exhaustion of physiological reserves, ii) by the correction of the wrong life habits, iii) by the prevention of risk factors and environmental stressors and, finally, empowering and boosting the individual’s reserves with an ad hoc learning and physical therapy and social intervention might change the quality of life of the aged individuals, the fate of mental decay and, finally, increase their self-efficacy. For the elderly subjects with reversible cognitive frailty (Figure 1:I), primary preventive intervention includes the pro-motion of physical activities, cognitive stimulation, exercise and a healthy diet (e.g., a Mediterranean diet, the cessation of smoking, promoting emotional recovery, engaging in an active and socially integrated lifestyle, an ideal amount of daily sleep, the maintenance of a proper body weight and metabolic control (including the control of dyslipidemia, diabetes and blood pressure)), as these measures boost patients’ ability to fight the disease (Sternberg et al.,2011; Desai et al., 2010). At this stage, secondary prevention for cognitive function and physical frailty is suggested. 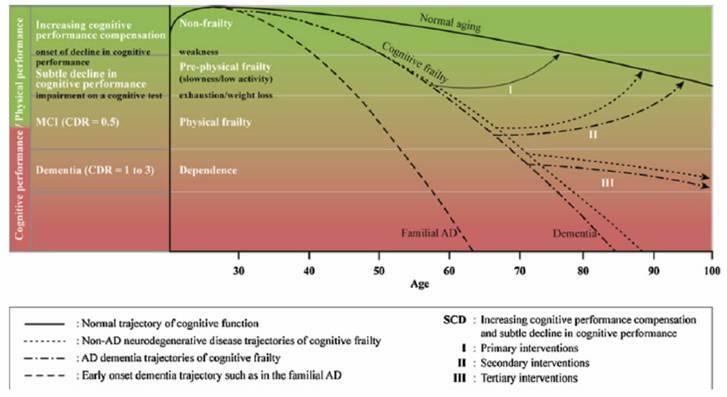 For the elderly subjects with potential cognitive frailty (Figure 1:II), secondary prevention is required, which comprises a geriatric assessment determining the cause of cognitive frailty and an evidence-based, medicinal, individualized multimodal intervention. Other measures, such as drug treatment for chronic diseases, fall prevention, exercise and nutrition support, which target physical, nutritional, cognitive and psychological domains, may delay the progression and secondary occurrence of cognitive frailty related adverse outcomes (Sternberget al., 2011; Desai et al., 2010; Kelaiditi et al., 2013; Moeley et al., 2013). Lastly, for the elderly subjects with irreversible cognitive impairment (Figure1:III) caused by physical factors that may lead to adverse health-related outcomes, such as disability or death, a comprehensive geriatric assessment is always required for intervention at this stage. In other words, a multimodal intervention with the main goal of rehabilitation and sustaining the quality of life is a suitable choice for these patients.